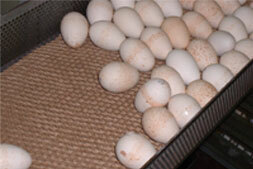 Midlantic Poultry Products, Inc has been serving the needs of the Poultry Industry since November 1986. It was at that time, following discussions with several hatchery experts that the Midlantic Pad was invented and patented in 1987. 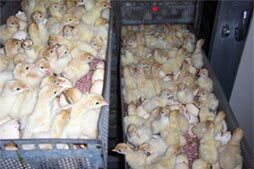 Designed with the needs of today’s hatcheries, the Midlantic Pad for hatch trays allows air flow in your hatching machines, while capturing fluff and airborne contaminants, thus allowing for the best possible hatch and bird quality. The pad design also allows the newly hatched birds to achieve excellent grip which significantly reduces leg problems and allows them to get onto their feet quicker resulting in cleaner, dryer navels and overall excellent bird quality. Some studies have shown an increase of almost 5 saleable poults per tray (over 4%) when the Midlantic Pad was used. From the hatchery to the brooding house the Midlantic Pad also provides cushioning and positive footing during transportation. This transport box pad is free from contaminants unlike some other conventional materials. The Midlantic Pad is used extensively in the poultry industry throughout North America by such professional companies as Cuddy Farms, Cargill, Ag.Forte, Hy-Line, Cobb, MacFarlane and Willmar. In Europe, British United Turkeys has been using the Midlantic Pad for several years. Other high quality European hatcheries such as Miko from Austria are also now realizing the benefits of the Midlantic Pad in terms of higher hatchability and better poult quality.